On November 12, 2013, two PACAW, Inc. board members, namely the President and the project coordinator for Kogi and Kwara States in Nigeria, met with the Principal of the high school, the Headmaster, the Headmistress and the Assistant Headmistress of the primary schools at Koro-Ekiti, the small village in Kwara State, Nigeria where PACAW, Inc. is currently active. Also in attendance was the retired Headmaster of the primary school. We discussed the progress of the children in the three schools. Also discussed at length was the laundry list of the needs in the three schools. Going into the meeting, the intention of PACAW, Inc. was to proceed with the library projects in the three schools in accordance with our schedule of projects. However, during our discussion, the school leaders stated that their top priority was Staffing. There was a critical shortage of teachers in the two primary schools and in the secondary school. The primary schools needed six teachers in order to maintain a full complement of teachers and to halt the shameful practice of, for example, combining the kindergarten and first grade classes because of lack of teachers. The secondary school desperately needed two teachers, one for science and the other for mathematics. Following the discussion, PACAW, Inc. promised to employ eight new teachers for the three schools beginning in January 2014. A committee was set up to advertise the positions and to interview the candidates. The eight teachers were employed and began working in the schools in January 2014. In April 2014, another teacher was added in the secondary school to instruct the students in basic computer skills, bringing the total number of PACAW, Inc. teachers to eight in the primary schools and three in the secondary school. This is a lesson for small and large NGOs. The local communities know best their most pressing needs. NGOs, especially foreign ones must tailor their programs and services to the wishes of the communities, as long as those wishes are in tune with the overall philosophy of the NGO. Next on our agenda were the library projects in the three schools, and the science and computer center projects in the primary schools. These projects were completed in September 2014. 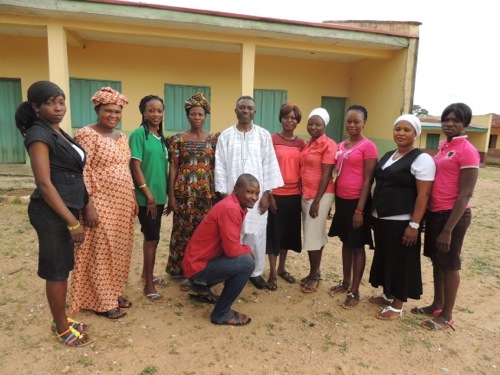 PACAW Inc. teachers and Dr. Ayeni,(center) during the PACAW Leadership Academy in September 2014. One of the teachers in the secondary school is not in this picture. UPDATE: Posted, February 16, 2015. In November 2014, another teacher was added to the primary school staff to teach Mathematics and basic computer skills. Thus bringing the total number of PACAW, Inc. teaching staff in the schools to twelve. Update: Posted March 1, 2016. We continue to maintain our teaching staff in the schools. In addition, we have one non teaching staff in the primary school in Koro-Ekiti, Kwara State, Nigeria.